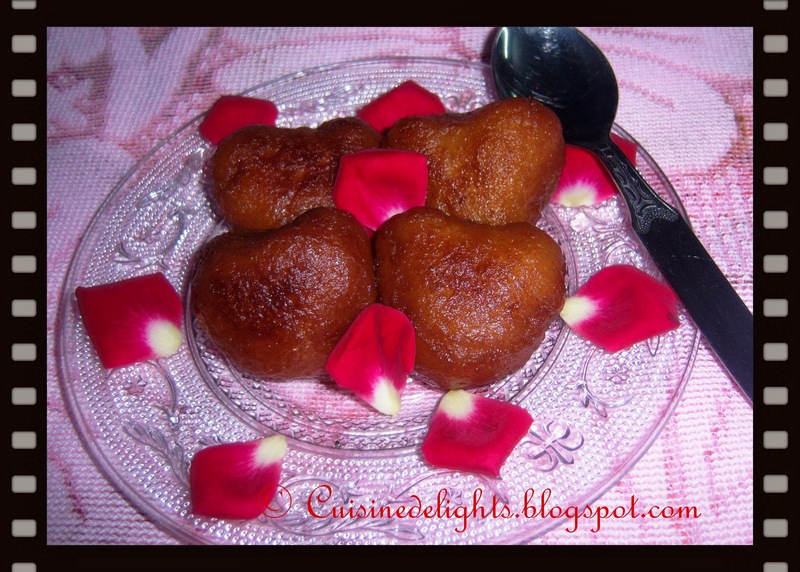 Gulab jamun is one of the most simplest and authentic Indian dessert recipe. Gulab jamun- the name itself tempts us very much right? This delicious dessert consists of milk powder/ mava and maida is formed to a dough and deep fried in ghee/ oil. These fried balls are soaked in a sugar syrup infused with cardamom. When the fried balls soak up all that sugar syrup and become soft and spongy which just melt in your mouth. For making Sugar Syrup - Make a simple syrup by adding the water and sugar. Let the sugar melt completely. Now add the cardamom and saffron (optional) and simmer for five more minutes. Turn off the heat. 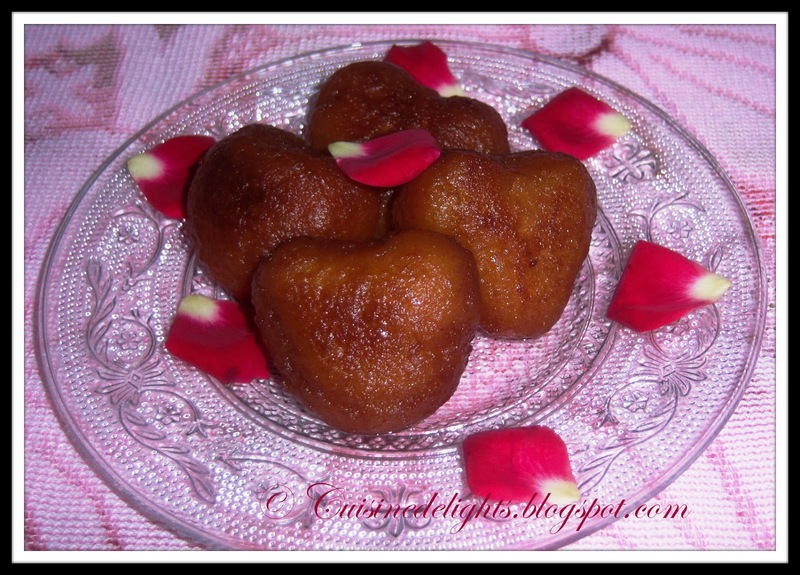 For making Gulab jamun- Mix all the dry ingredients and slowly incorporate the milk little at a time to make a dough. Make sure there are no lumps in the dough. Divide the dough to 15 equal parts. Apply some ghee to your palms and make 15 round ball. 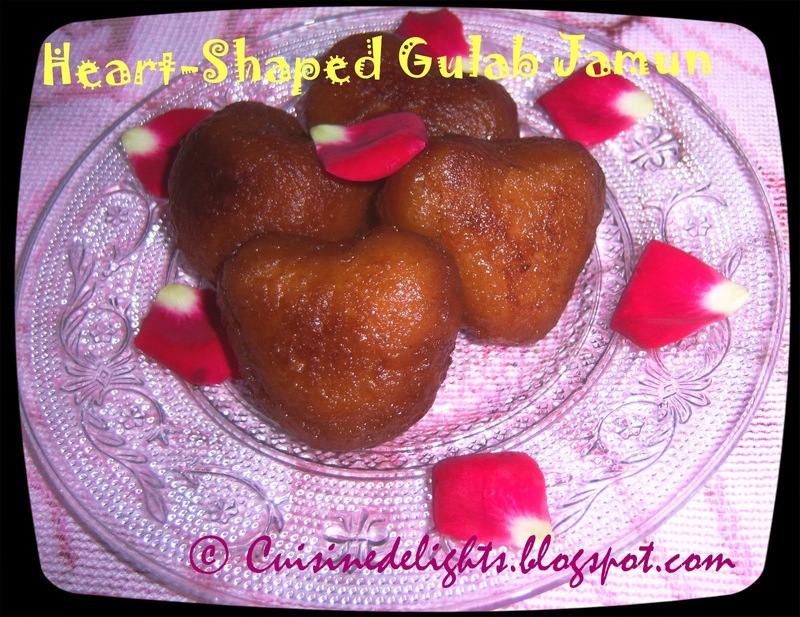 For the heart shaped Gulab jamun- take some dough flatten it with your palms. To get he heart haped you can either use a cookie cutter or a butter knife. I just used the butter knife to make the heart shapes. Now take oil for deep frying. Keep it on low- medium heat and drop the balls about four at a time. Slowly fry them, by moving them around so they are cooked evenly on all sides. It's very important to keep the temperature to low and cook them slowly. If not the the jamun's will brown on the outside and still uncooked inside. Remove the fried balls in a paper towel and continuing frying the rest. Add the fried balls to the sugar syrup. make sure they are completely immersed in the syrup. Let sit for at least an hour before serving. Before serving, you can add some rose petals for garnishing.